Most of our prairie herbs, shrubs and trees flower in the spring months. Some are still flowering in late July. By mid August most flowers except for asters, goldenrod and several composite flowered ground plants, have finished flowering and are starting to show enlarged seed pods or fruit, some with attractive color patterns. Dogbane—long green, turning bright red, bean-like seed pods from the sweet smelling flowers around a high ridge around a beaver pond experienced in June. Do the colors help in seeing distribution? Many leaves of lilies with their characteristic venation were found also. Within 100 feet of the sign of the Caernarvon Farm at the north east corner of Saunders Lake, we found Jewelweed with its orange flowers—Impatiens capensis Meerb forma citrina (Weath. ), according to Grays Manual of Botany (8th ed.). This is the first time I’ve seen it in western Canada. I would be interested to know if others have seen this in southern Alberta where there may be poison ivy. 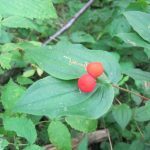 Sources on the Internet say that you can crush and rub jewelweed over poison ivy contact spots to denature the plant’s uroshiol poison.